Are you interested in selling your home in the next few months? 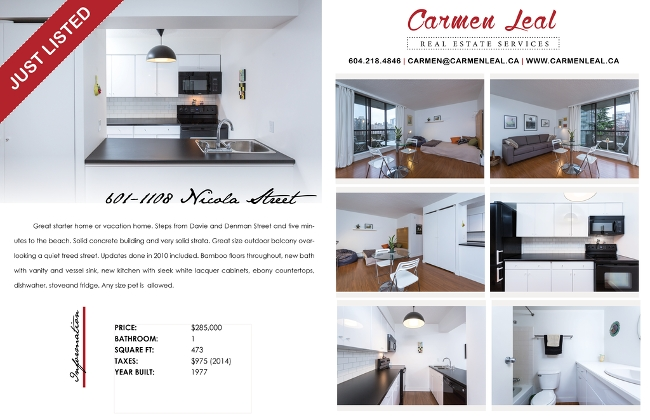 Work with award winning realtor, Carmen Leal and her team that specialize in Real Estate Downtown Vancouver and have qualified Buyers that are looking for a home in your area! Contact carmen to list your home today! Get a hold of Carmen directly at 604.218.4846 or email carmen@carmenleal.ca to arrange an appointment. Selling your home I make sure that every home that I market gets its own creative marketing strategy designed for that specific home by myself and my talented team! My strategy goes beyond having it only on MLS * is not the only source to sell your home. This is what I provide for my clients as to MY strategy to drive showings, traffic and to get your home Sold. When it comes to Marketing a home Carmen Leal believes that EVERY HOME DEMANDS ITS OWN STRATEGY and he has proven herself as a Realtor for DELIVERING MARKETING that differentiates herself and the properties she lists from the pack. When you LIST YOUR HOME with Carmen Leal, EXPECT A CREATIVE MARKETING STRATEGY Plan to get your HOME Sold. CARMEN will work for you every step of the way! Her combination of skill, experience, and technology ensures that she can sell your home for the highest possible price and in the shortest period of time. She definilty has the tools to meet the demands of a highly competitive, modern market. Samples of some of Carmen's Marketing Material.